Coming home after 10 days of work cleaning out my deceased father’s house, after an unexpectedly complicated flight and night in a strange city thanks to Delta airlines, with my luggage still in transit, an ailing pet at home, a tree fallen onto my house, and no food in the fridge…well, I’m a little melancholy and introspective. Since this is our first spring in this house, I only today learned that the tree that fell is an apricot, full of little green fruits. This reminded me of the Blenheim apricots I’d frozen last summer and not used yet. 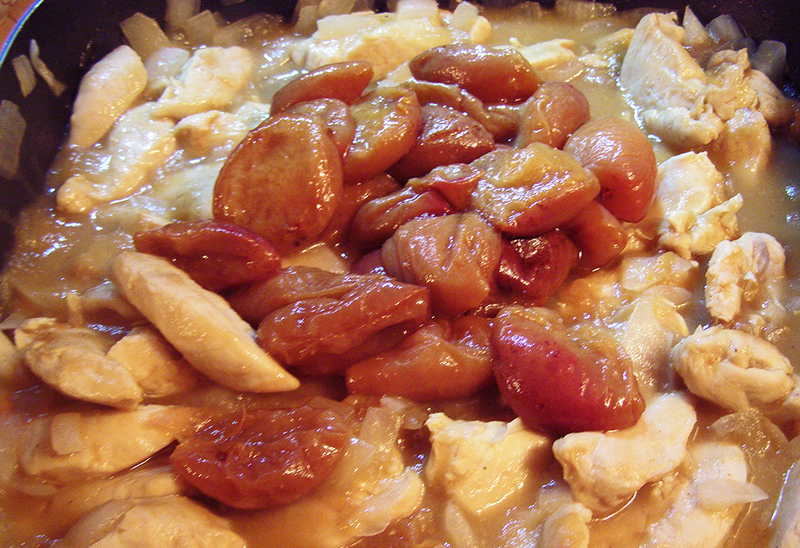 Seemed like a perfect time to make some apricot chicken and a little homemade apricot jam. Blenheim apricots were commercially popular before 1960, but are now quite rare in the marketplace. Their flavor is delectable, but their short shelf life and tendency to bruise easily makes them a less popular commercial crop than hardier, less flavorful varieties. You might find them, as we did, at a local farm (Live Earth Farm), or you can grow your own tree in most parts of the US. Rachael Ray created a recipe for chicken that used apricot preserves and dried or fresh apricots. 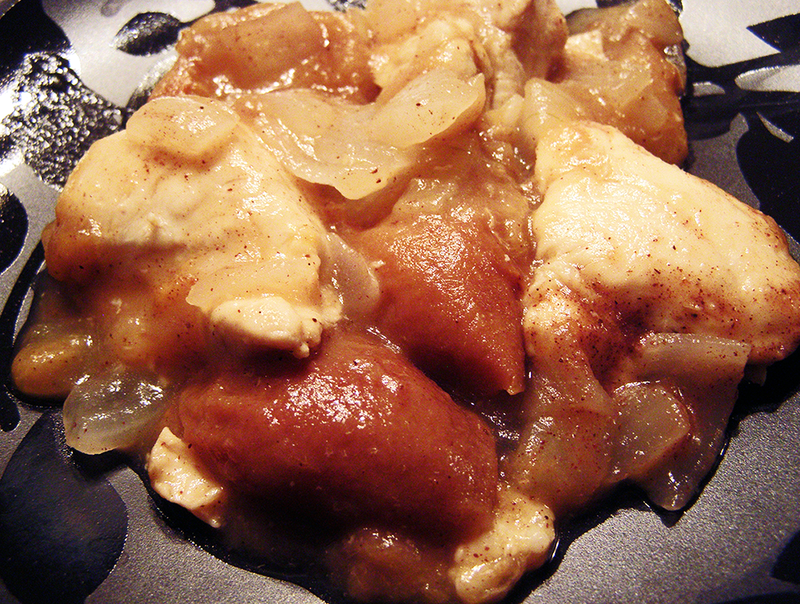 I tweaked it to use all fresh (or previously frozen) Blenheims, and added a touch of honey and cinnamon. Although it produces a ridiculously large amount of food, I have doubled this recipe during apricot season to serve 12. If you use fresh apricots, you can freeze some of the finished dish for delicious defrosting after apricot season. Cut chicken tenderloins in half crosswise at an angle. Chop onion. 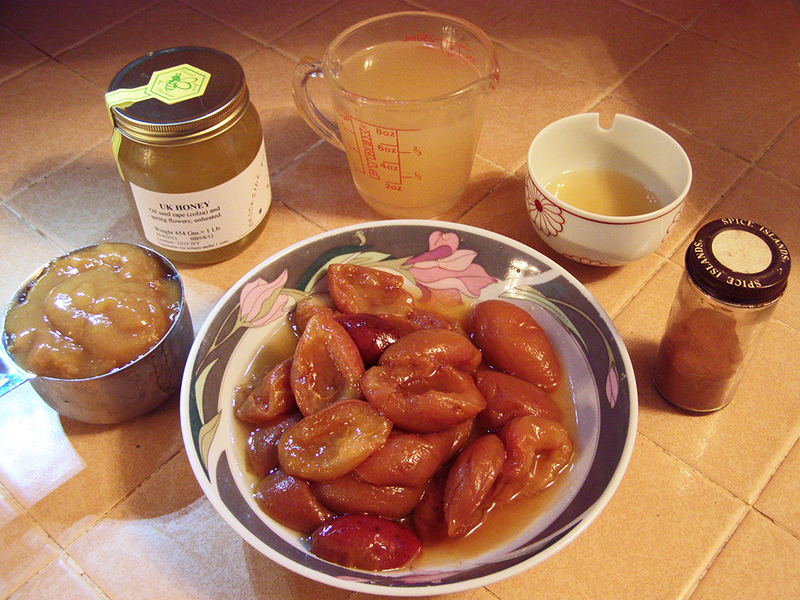 Cut whole apricots in half and discard pits. Heat a large skillet or electric frying pan over medium high heat. Add olive oil and chicken and season with salt and pepper. Lightly brown chicken for a few minutes on each side. Add onions and cook for 5 minutes. Add vinegar to pan, stir in a little and let it evaporate. Add apricots** and stock. 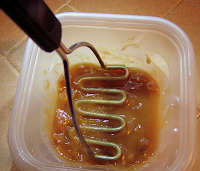 When stock comes to a bubble, stir in mashed or sieved apricots and honey. Cover pan, reduce heat, and simmer 10 - 15 minutes. Sprinkle with cinnamon to taste. *If using previously frozen Blenheim apricots, use the smaller amount of stock. For fresh apricots, use the larger amount. **If using previously frozen Blenheim apricots, add during last 5-10 minutes of cooking only, because the apricots’ texture is already soft after defrosting.